To be the leading complete electrical service company in Saskatchewan. We know that you're reputation is only as good as the results of your last job. That's why we pride ourselves on a result-oriented approach. At Globe-Elite Electrical Contractors Ltd, we've taken our collective experience to create our own methodology to keep your project on track and under budget. Globe Electric was formed in 1949 by Pete Suderman Sr. who hired a young man by the name of Ken Pickering in 1974. Ken aprenticed at Globe, learning all he could about the electrical field. Ken Pickering was a former Globe employee when he set up Elite Electric with his wife Barbara in 1984. Elite did both commercial and residential work. The company grew rapidly from two employees up to fifteen. A major turning point for Elite came while doing the electrical work on the $25 million Hotel Saskatchewan restoration and renovation project. The hotel was originally built in 1935 and has seen numerous renovations and expansions. When running and replacing wiring within the walls and ceiling spaces, difficulties and surprises were many, and trade knowledge and ingenuity were called upon for resolution by the team. Globe and Elite were brought together in a limited partnership in 1993. Today the company employs 15 people and it has expanded up to 50 when working on various projects. 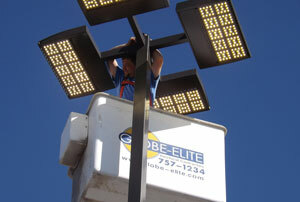 Ken Pickering is the current President of Globe-Elite Electrical Contractors. In 2007 Globe-Elite hired a young man by the name of Al Anderson who promptly showed his value and worked his way up. As of May in 2013 he became a partner of Globe-Elite Electrical Contractors Ltd. Al Anderson currently holds the Secretary/Treasurer position for the company.